US president Donald Trump’s intimidating, hawkish UN General Assembly speech was, at best, an unflinching reaffirmation to US jingoism, despite his election promises to do the opposite. Trump hurled his 41-minute tirade of diplomatic gaffs and gaslighting at self-determined governments and brazenly guilt-tripped the United Nations’ in a manner not seen since Hitler’s 1937 address regarding the defunct League of Nations. Despite the inconsolable depravity of his words, one should focus more on their timing and intentions in order to decipher the US president’s subversive agenda. Trump’s UN call for ‘unity and obedience’ reveals several pressing urgencies for the US military dictatorship behind him, who grow more desperate than ever to fulfil their geopolitical agendas sat behind the claptrap of ‘human rights, peace, democracy, and national sovereignty’. It has been firmly established that the current US administration is solely in charge of managing dollar diplomacy around the world, and, in the wake of the 9th annual BRICS Summit in Xiamen and flagship Belt and Road Summit held in Hong Kong, are terrified of a massive global divestment in dollar-denominated oil driven by Chinese-led development. Nearly Trump’s entire cabinet—a roster consisting of seasoned military generals—allows him more intimate coordination with its bloated coercive apparatus (military) to enforce dollar hegemony. Underneath its harsh, superstructural rhetoric, the Trump administration is attempting to seize two strategic oil shipping routes, the Strait of Hormuz and the Strait of Malacca, in order to usurp the lion’s share of global oil trade from the Asian continent and underpin its petrodollar hegemony. In order to do this, Trump wishes to rally support for a military intervention on Pyongyang and later, Iran, in order to occupy indispensable maritime shipping lanes to indefinitely frustrate China’s access to the South China Sea, which is inextricably connected to both straits. With a military presence near the Korean peninsula, the Trump administration, with help from its vassals Japan and Taiwan, can eventually obstruct oil transit flowing from the Malacca and Hormuz Straits, which would stymie China’s access to critical Pacific-Atlantic bottlenecks vital to the One Belt, One Road initiative into Europe, southern Africa, and the Western hemisphere. 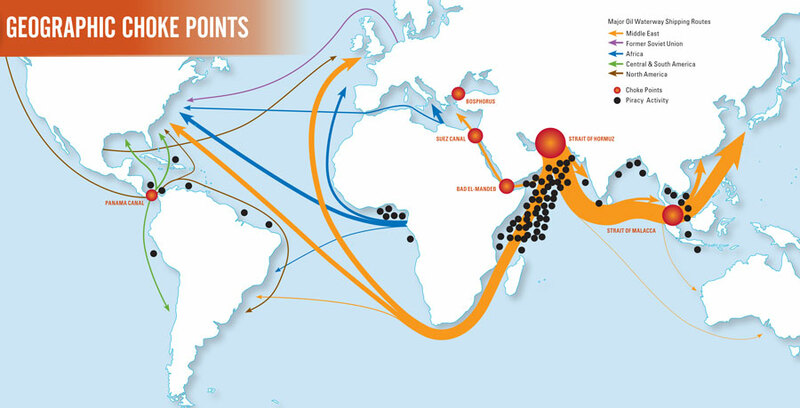 This would force the Chinese to rely on land transit and secondary shipping routes, incurring a costly and dangerous journey for OBOR resources and significantly hampering the initiative. Additionally, one must stress the baselessness of American casus belli. It is not in Pyongyang’s material or ideological interests to turn South Korea into a “sea of flames” as many corporate media outlets typically report, but to reunify the peninsula using its’ five-point initiative, put in place since DPRK founder Kim Il-Sung spearheaded it to comply with UN Resolution 377. The Kim Jong-Un administration has begun procuring several nuclear deterrents as a response to the joint US-South Korean Ulchi Freedom Guardian and Foal Eagle military drills, which, over the last 40 years, have continuously violated this resolution by inflaming tensions. As long as the U.S. hostile policy and nuclear threat continue, the DPRK, no matter who may say what, will never place its self-defensive nuclear deterrence on the negotiating table nor flinch an inch from the road chosen by itself, the road of bolstering up the state nuclear force. The final goal of our State is to achieve equilibrium of force with the U.S. so that the U.S. chief executive may not talk about military option against the DPRK. US militarism against Pyongyang merely expresses the fear that North Korea will attack its vassals or a major American city, not Seoul. This is precisely why it has installed Terminal High Altitude Area Defence (THAAD) systems to target medium and long-range attacks, and not short-range attacks, which are as dangerous to Seoul as Pyongyang; a Duran article outlines this in detail. The increased hostility against North Korea also reflects just how few options the US truly has, now that the Philippines and Indonesia, two key positions along the Strait of Malacca, have aligned themselves with China and joined the Asia Infrastructure Investment Bank. America’s hasty attacks on North Korea and Iran reveal another imperative for the US—new developments on the Diaoyu islands, which demonstrate the industriousness of the People’s Liberation Army (PLA) in securing the islands, effectively ending the territorial dispute. In February of 2017, satellite photos surfaced indicating that China was close to completing the construction of surface to air missile (SAMs) systems on the [Diaoyu] Islands [which] allow China to move significantly closer to establishing an Air Force Defense Identification Zone (ADIZ) in the area, which would secure Chinese air sovereignty. America’s presence near the South China Sea also endangers long-established core shipping routes with Venezuela, who wields the world’s largest proven oil reserves. With an estimated 298 billion barrels of oil, [Venezuela] is endowed with the world’s largest proven oil reserves, eclipsing Saudi Arabia (266), Iran (157) and Russia (80). By blocking secure access to South America, the US wishes to prevent Venezuela’s inclusion into China’s rapidly expanding repertoire of oil sources and further denomination of oil sales in yuan. Since 2007, Beijing has extended $50 billion in long-term loans to be repaid through oil deliveries of 600,000 barrels per day [and] provide Caracas with an additional $20 billion loan. In addition, China is building a refinery in Guandong province in order to process 400,000 barrels of Venezuelan crude oil per day. Interfering with the Strait of Malacca also blackmails another BRICS member—India—by blocking its Andaman Sea conduit via the strait, preventing it from receiving critical oil from none other than, of course, Venezuela. India […] imports 72 per cent of its oil requirements, with this figure set to rise to 88 per cent over the coming decades. Imports from the perennially unstable Persian Gulf currently meet about half of India’s total oil requirements – a statistic that New Delhi would like to change. As a result, New Delhi has taken initial steps to establish a long-term energy relationship with Venezuela. Fascism is capitalism at gunpoint, and Trump’s aspirations are no exception. By monopolising global oil trade with gunboat diplomacy, Trump, Inc. aspires to thwart the successes of the OBOR, potentially inciting a full-scale conflict that will be economically, militarily, and politically disastrous for all parties. Despite his calls for rapprochement with China and Russia, the endgame is to supplant them with the petrodollar; this is the reason for America’s latest round of Russian sanctions and meddling in the South China Sea. It is important that Beijing and Moscow take the necessary steps to prevent this from happening. The world depends on it. Precisely, the “Rohingya crisis” used against Myanmar is an attempt to prevent China’s alternate bypass of the Strait of Malacca. While the Yemeni crisis (Genocide) is to control Bab el Mandab. It seems the Chinese are being blocked at every corner. The Balkan route for Chinese goods to the EU is also being taken out, with only Serbia (The unfinished business in Europe – according to Killary Clinton) standing “barely” . This is PNAC strategy against all competitors. You are correct, and if the world is not willing to fight back then the world can live as vassals of the greater Anglo Zionist empire.